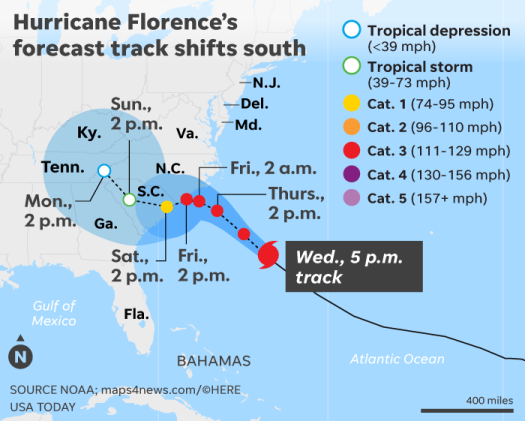 MYRTLE BEACH, S.C. — The big slosh has begun, and the consequences could be disastrous. Forecasters said that given the storm’s size and sluggish track, it could cause epic damage akin to what the Houston area saw during Hurricane Harvey just over a year ago, with floodwaters swamping homes and businesses and washing over industrial and farm waste sites. Some of those who are getting out of the way of Hurricane Florence and landing in Chicago. Many passengers were relieved to make it into Chicago just before the airports in the southeast started shutting down Wednesday night. They were sending thoughts and prayers to their friends and family back home. Many passengers flew to Chicago to be with relatives while they wait out the storm. They described the panic back home to stock up on supplies, the long lines for gas… and their concerns that that they will be returning back home to damage and destruction. “I feel great being up here out of it, but I worry about all the family and friends back home,” said Teresa Moore, who lives in Raleigh. And help is on the way from the Chicago-area at the request of FEMA. A group of paramedics and several ambulances from Elite Medical Transportation are in North and South Carolina to help with the evacuations.